The Addled Creative | I am forever discovering new things I want to try! Join me as I hop from one project to another! The blog has been quiet for a while, but I have been busier than ever. I finally took the plunge and started a sewing business in March. I would never have imagined how fast it would grow! In fact I have as much as I can handle right now considering I’m still working my day job. I hope to start blogging about my makes as soon as I figure out how to better organize my time. 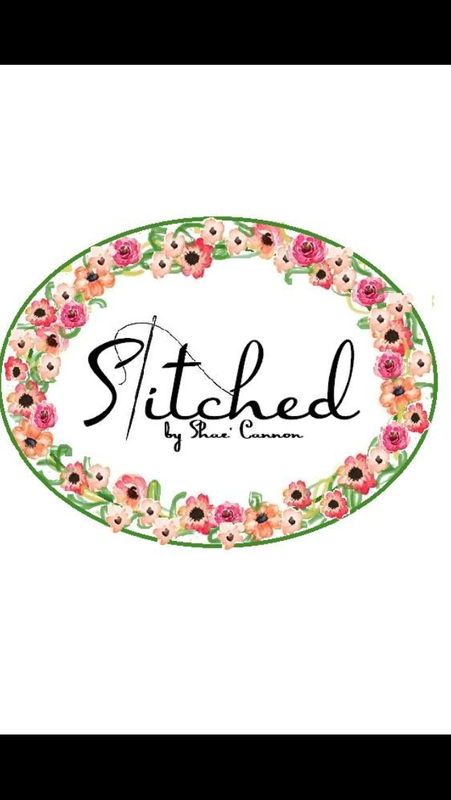 For now, you can find Stitched by Shae’ Cannon on Instagram as @stitchedsc and on Facebook as Stitched by Shae’ Cannon. As I mentioned in my last post, I had taken a few vacation days in December. Amidst all the “busy-ness” of the season I made some time to do a little sewing and drawing. I have been on the search for a vest pattern for quite a while, and I finally found one that I love! It is the Modern Silhouette Vest from Indygo Junction. I have no idea how I missed this pattern in previous searches. It is exactly what I envisioned wanting. 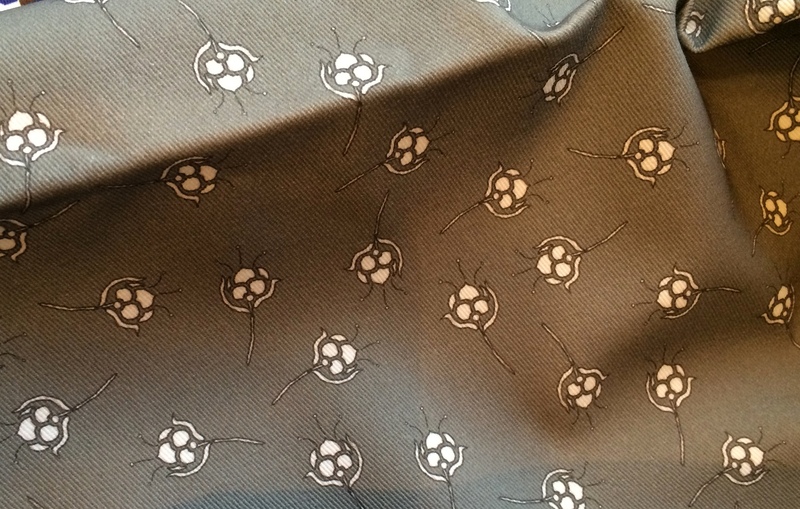 I have several cuts of medium weight linen from fabrics-store.com, and chose the gray color “asphalt” for my vest. I already have plans for several more versions in both woven fabrics and knits. I can see myself getting tons of wear out of this, especially considering we have been having 75 degree weather lately. On the drawing front, I have been commissioned to do a portrait. I worked on it before Christmas, but the client and I decided that the photo chosen just wasn’t working (the resolution was low and I wasn’t happy with my resulting lack of detail), so she is taking more photos over the Christmas holidays. We will meet in the next week or so to finalize the photo and I will begin a new version. In the meantime, I decided to try out some new techniques in an effort to improve my blending skills. A friend had given me a photo (a year and a half ago, eek!) of her son when he was a toddler for me to do a portrait, and had told me to “take my time”, and she “wasn’t in a hurry”. I don’t think she will ever do that again! I decided to pick it back up and implement the new (to me) blending techniques/approach to drawing and I am so pleased with the result! I know that I still have room (a great deal) to improve, but I think this is so much better than previous attempts. My friend has only seen a photo of it, but she said she loves it, and that is all that matters to me! and making the Christmas cookies (not iced!). Luckily, my Christmas spirit finally showed up that day, and I have been enjoying it ever since! In fact, I am gonna embrace my English brother-in-law’s tradition of leaving it all up until New Years! I also wanted to share photos of our tree and some of our ornaments. We started our ornament collection the year we married (1993) with one from the Coca Cola Museum in Atlanta, GA. I was a senior at Auburn University, and my then-fiancé and I drove to Atlanta to pick up my wedding dress. While there we toured the museum and bought the ornament, starting a tradition of buying an ornament or two (or three!) each year. Well, there you have it. Believe it or not, I have enough Christmas decorations for every room of my house (including bathrooms), a Christmas village, and outside items. Maybe next year I will get it all out and up, and in a timely fashion. More importantly, we have had some good quality family time (the Hubs got home Christmas morning and was off the weekend), and I had some vacation days saved so I have been off some with the boys during their school break. I have enjoyed this Christmas more than almost any other we have had despite the “scrooge” beginning! I finished up my second ever pair of knitted socks last night. I cast them on in March, worked up about 2 inches of ribbing on each one, then put them aside. I cannot remember exactly but I believe I used a Lornas Laces sock yarn. I knit them using US2 DPNs (I much prefer DPNs over circular needles for socks) mainly because they were the smallest DPNs I had on hand. I have since ordered US1 DPNs because it seems most sock patterns call for them. I picked them back up the week of Thanksgiving and knitted about every evening on them to finish them up, so I am saying it took me almost three weeks to make them. I didn’t really have a pattern for them. I like 2×2 ribbing, and I had used 64 stitches on my last socks, so that is what I started with. Because I wasn’t using a pattern, I knew I would have to do internet searches for each part. One completed pair of socks done a year ago does not an expert make! When it got time to do the heel flap, I lucked up and found the Knit Along sock series by Hands Occupied, (This link is for day one. Here are the links for the Day 2 Heel Flap, Day 3 Heel Turn, Day 4 Gusset, Day 5 Toe) which I went back to time and again when I was stuck on how to do something. I had used the Kitchener Stitch on my first pair, so I went back to the internet and found a tutorial (I don’t know about you, but that stitch, while easy, has several steps that I have trouble keeping in order. Also, I found that watching a video of it made it much easier for me to grasp). The one I used is by The Knit Witch, found on YouTube. I really like the Kitchener Stitch because it seamlessly grafts two rows of live seams together. I always hated the toe seams on RTW socks so I definitely didn’t want to put one in socks I spent forever knitting! I am wearing them today for the first time, and today just happens to be my 29th (haha) birthday, so these will forever be my birthday socks! 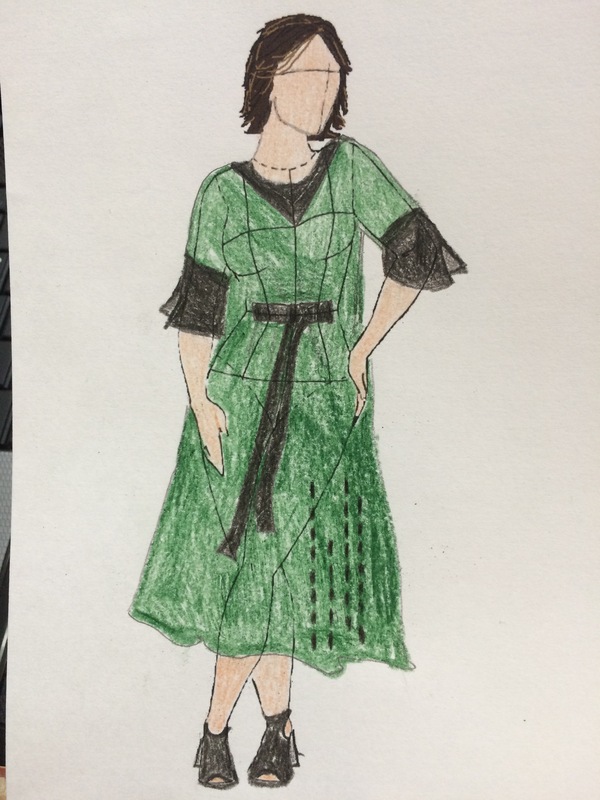 I am so excited to be participating in the sewalong for Cashmerette‘s wrap dress pattern, the Appleton Dress. 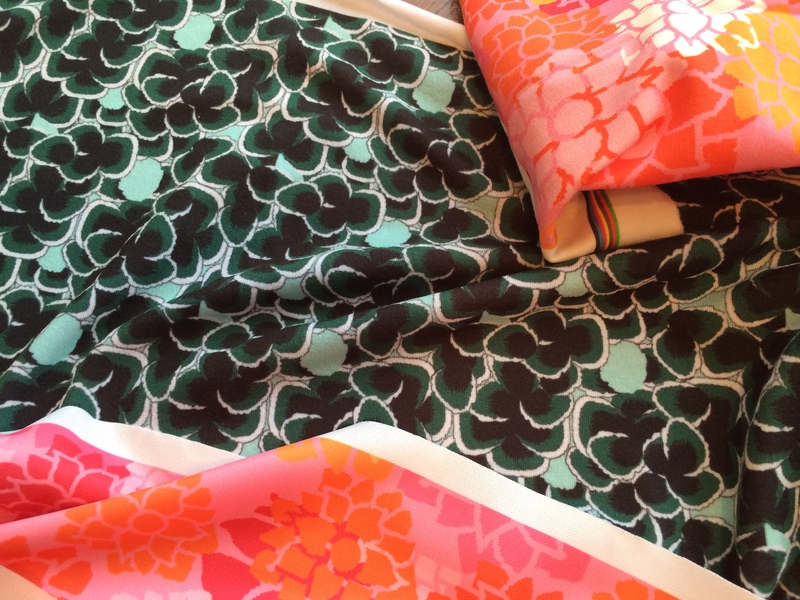 What is so exciting about this pattern is that it is drafted just for us “curvy” girls who need more coverage in the bust area than most RTW wrap dresses or wrap dress sewing patterns usually provide. Jenny’s pattern is sized from a C/D bust to a G/H bust and in sizes 12 -28! 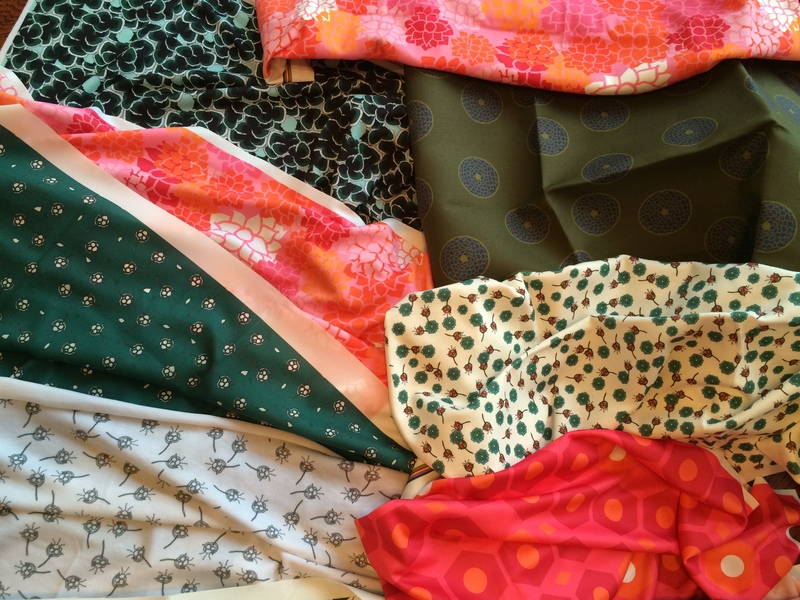 The sewalong officially starts today, but I will not be able to start until my fabric arrives. I found the most beautiful printed knit on MarcyTilton.com called the Montage Knit. Cannot wait until it arrives and I can begin. I will have some “catch up” to do but I think I have sewn enough with knits that it will be doable. If you have ever wanted to sew a wrap dress but thought they weren’t for your body shape, I encourage you to check out the Appleton. Every version I have seen has been lovely! It’s costume time again, but not just because it’s Halloween month. Our local high school homecoming is this week, and today each class has a theme to follow for dressing up. I made two costumes, both without patterns. 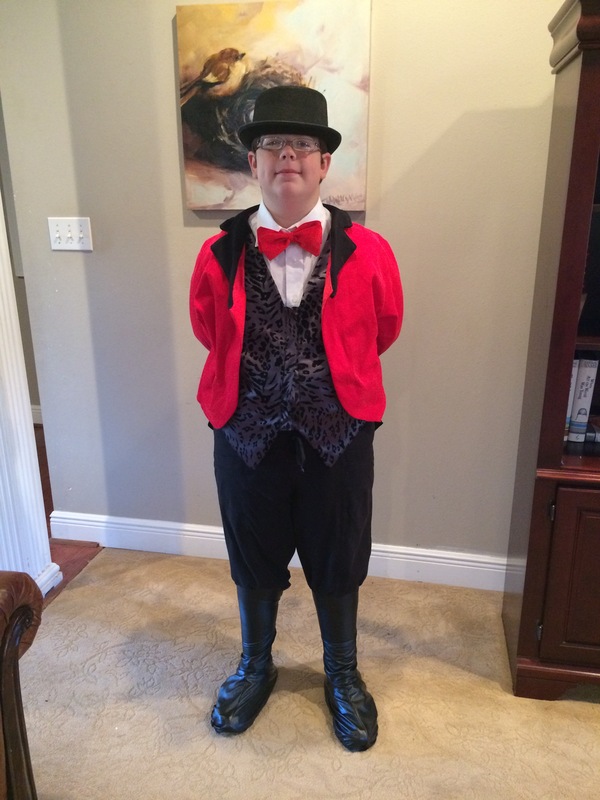 E-man is ready to enter the Big Top! The second costume I made is for a friend’s daughter who is a senior this year. 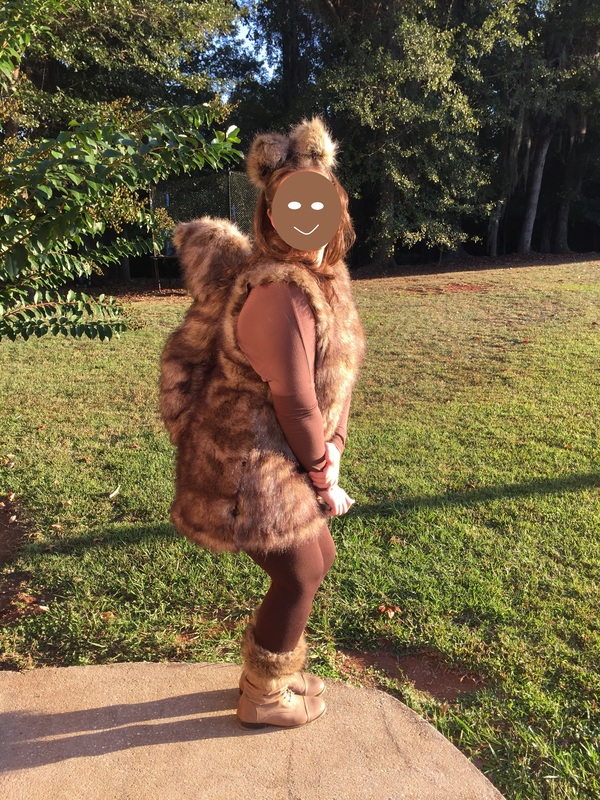 Her class theme was “The Hunters and The Hunted”, and she chose to be a squirrel. Her mom bought 1 1/4 yards of faux fur, and I used an existing vest as the template to cut out the top. I cut out a slightly shaped tube for the tail, seamed it up, stuffed lightly with polyfil, and straightened a metal hanger out to give the tube some stability. I then just safety pinned it to the vest so it would stay upright. The ears are just rounded triangles seamed about an inch at the top and folded in at the bottom and seamed, then turned right side out and pinned to a headband. Voila! She had faux fur boot tops that matched perfectly and just added a brown top and leggings. I think she is the most adorable squirrel I have ever seen! Where I live (The Deep South) football is the king of fall. People sport their favorite team logos on everything from hats and Tshirts to, you guessed it, ties. 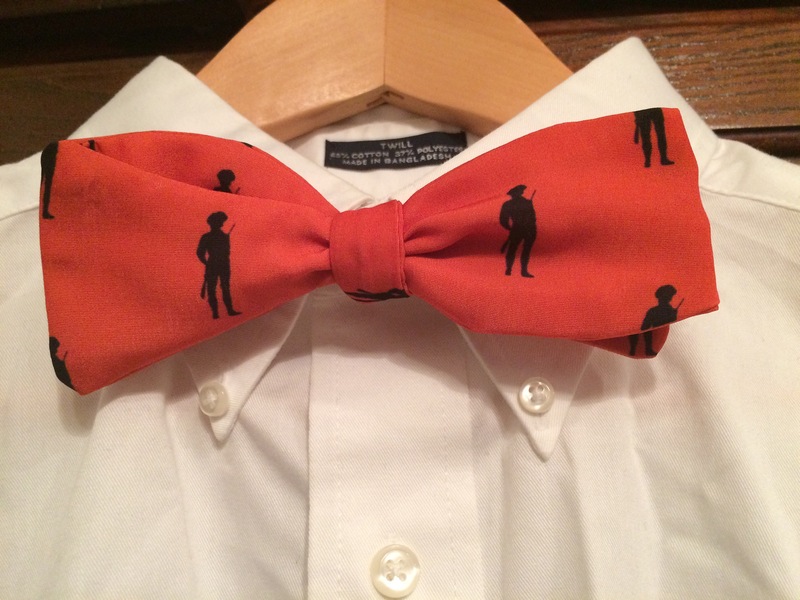 I decided to design a fabric for bow ties featuring my sons’ school mascot the Volunteers (think Minutemen) in our school colors orange and black. I chose bow ties over neckties for two main reasons. One, they take much less fabric per tie, and second, bow ties seem to be pretty popular with the boys at our school right now. I am pretty chuffed with the result! I love the two coral/pink fabrics. 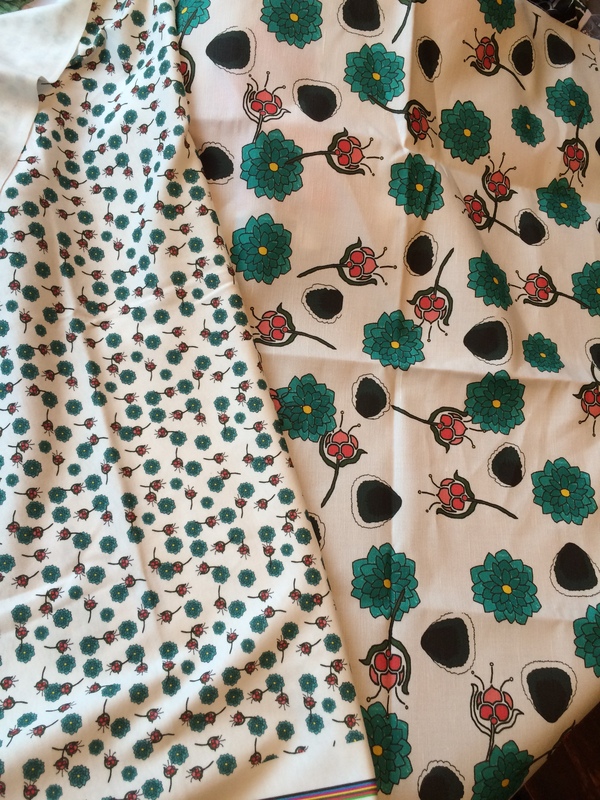 One is a geometric print and the other an abstract floral . 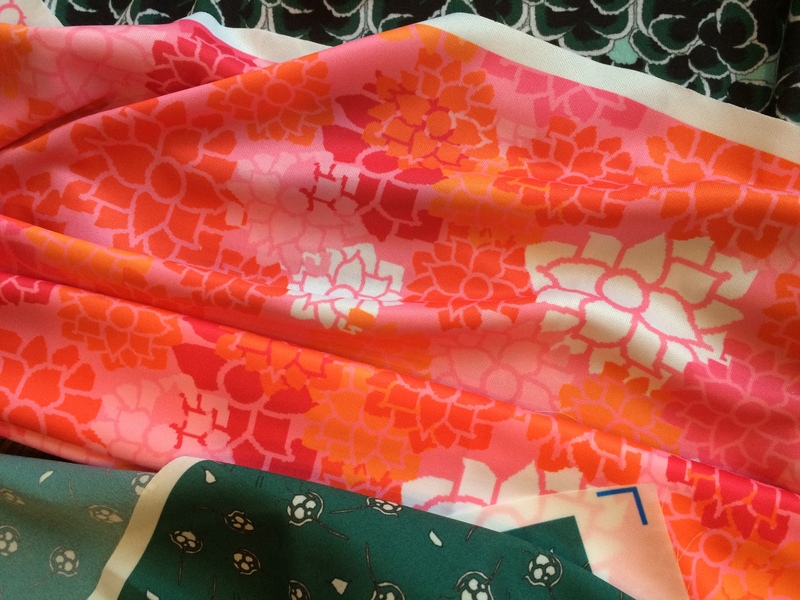 Both of these I can see as workout tanks in Spoonflower.com’s new Sport Lycra fabric. 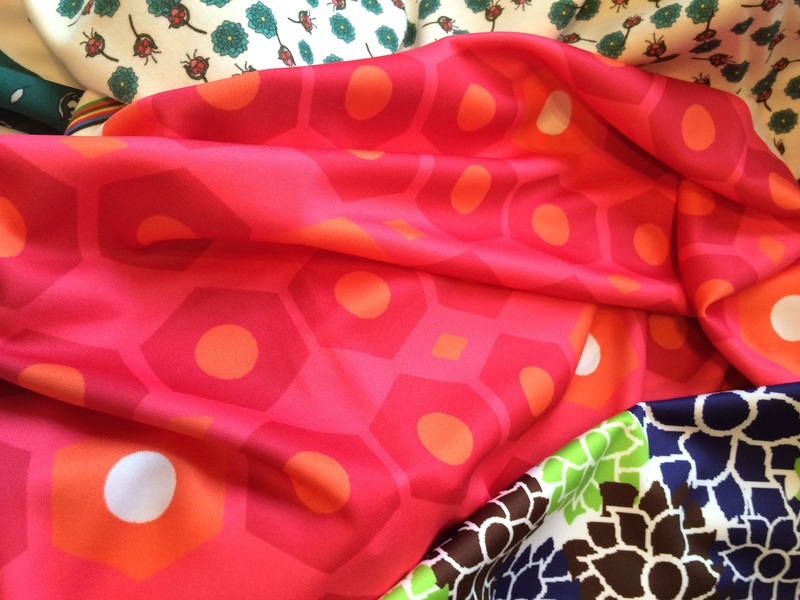 The geometric sample is in the sport lycra. It has 12% lycra and is moisture-wicking, so it is perfect for workout wear. 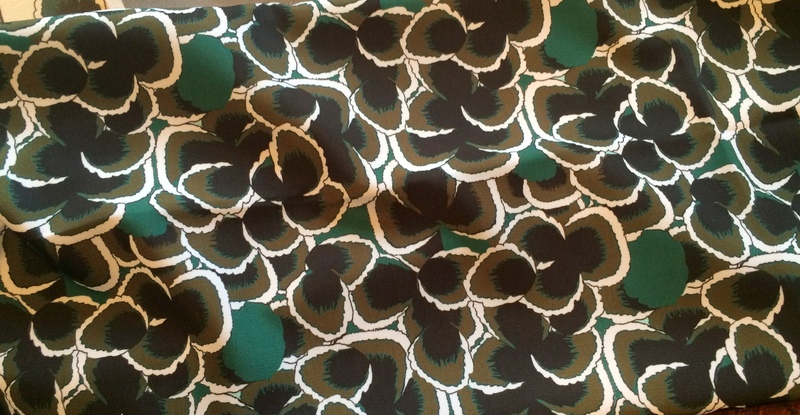 The green fabrics I can see as flowing tops , dresses, or scarves. 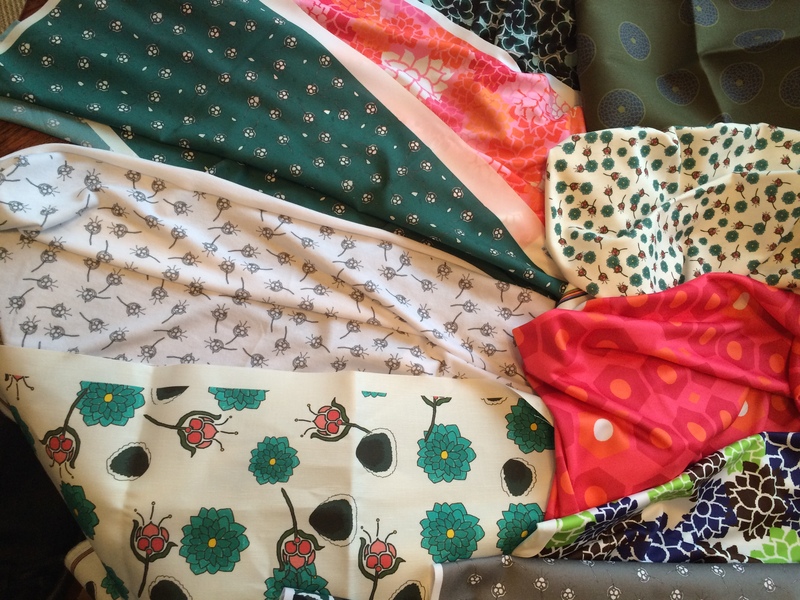 Spoonflower.com has several options for this: poly crepe de chine, silk crepe de chine, modern jersey, and silky faille to name several. 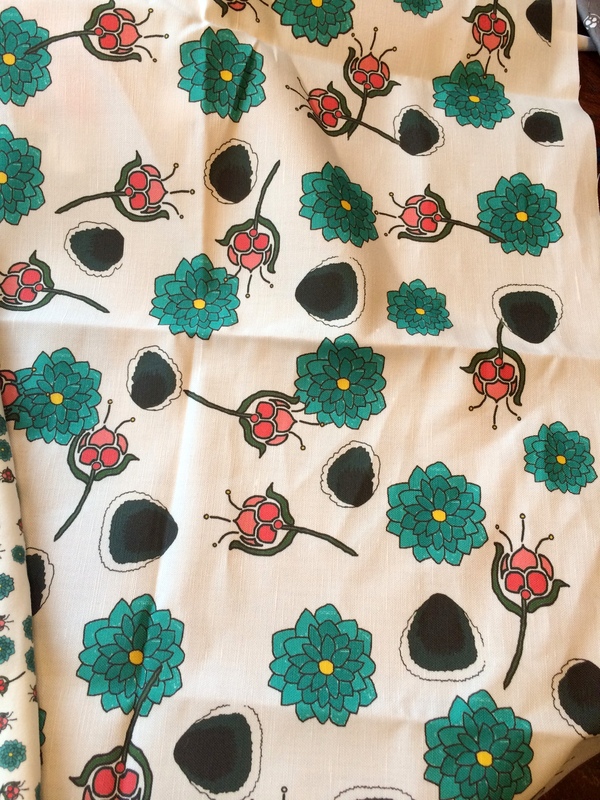 I ordered several of my prints in the linen cotton canvas and the heavy cotton twill because I just knew I would want them for sewing ipad cases, makeup bags, pouches, etc. I decided upon viewing them that I really liked the feathers and floral print above for clothing also (with its coordinating mini print below), especially after seeing it on Spoonflower’s new site SproutPatterns.com (beta version right now) as a Myrtle Dress. 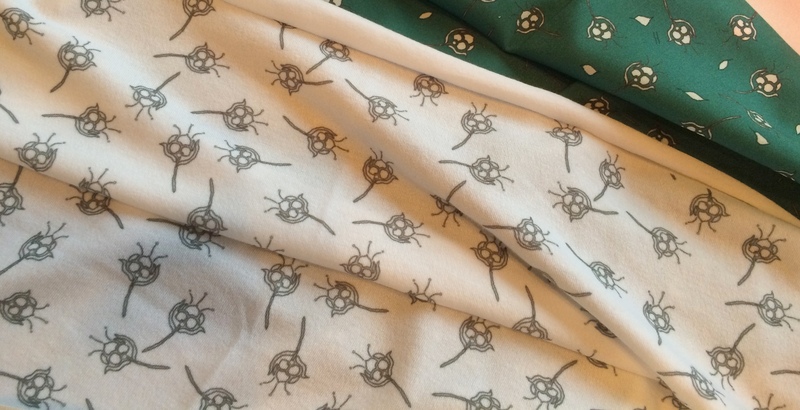 SproutPatterns.com is a sister site to Spoonflower.com where they offer a limited number of patterns that can be customized with your fabric choices from their site (your own designs or any others they offer for sale) and the pattern pieces are printed out with your design choices directly on the fabric. All you have to do when you get it is cut out and sew. How cool is that??? 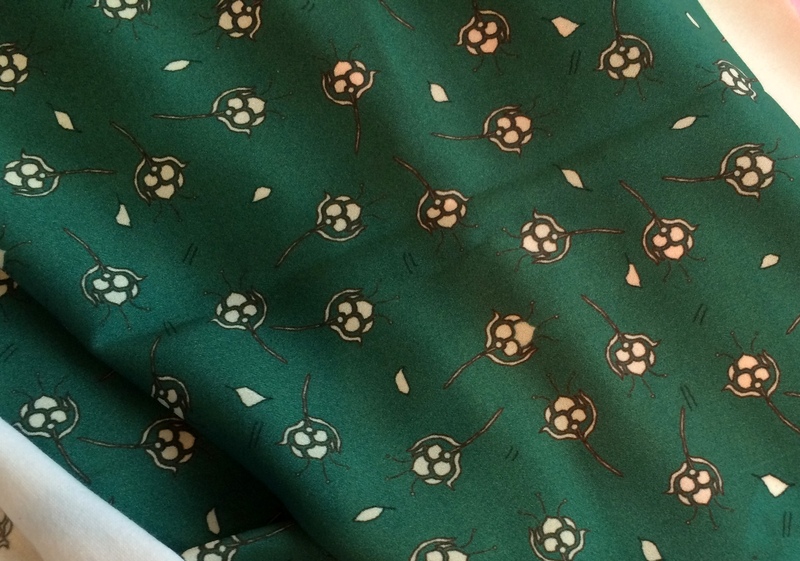 I have some medium Weight linen in a dark forest green that I have not been able to decide what to sew it up as. It was just too dark for my taste as a summer item. Where I live it will be pretty warm well into November, so I figured why not make a fall dress? I browsed around on the Internet for some dress ideas and found one on Etsy that I liked in the Idea2lifestyle shop. I have an existing pattern I think I can alter enough to accomplish this. The black at the neck and sleeves are just attachments to make the dress look layered; I have some handkerchief weight black linen I think will work well for this. I plan on making the 3/4 sleeves vented to above the elbow to minimize wrinkling from bending my arms. I want to do some type of embroidery in black on the skirt, possibly shashiko, a Japanese form of embroidery dating back to the 1600’s. I like the inspiration dress’s long front ties, which are shown both tied and left hanging. I will probably wear them tied to cinch the waist in some and give a little shape to an otherwise loose design. I am forever discovering new things I want to try! Join me as I hop from one project to another!